As a Naruto clone disappears, the real Naruto comes face to face with the masked man and attempts to headbutt the mask. As the masked man readies his reincarnated Jinchuriki, Naruto recognises one of the jutsu. In a fantasy world, Naruto meets with a reincarnated Utakata, who reveals what became of him after he left Tsuchigumo village. After the conversation, the reanimated Jinchūriki use various jutsus to attack Naruto and Killer Bee. 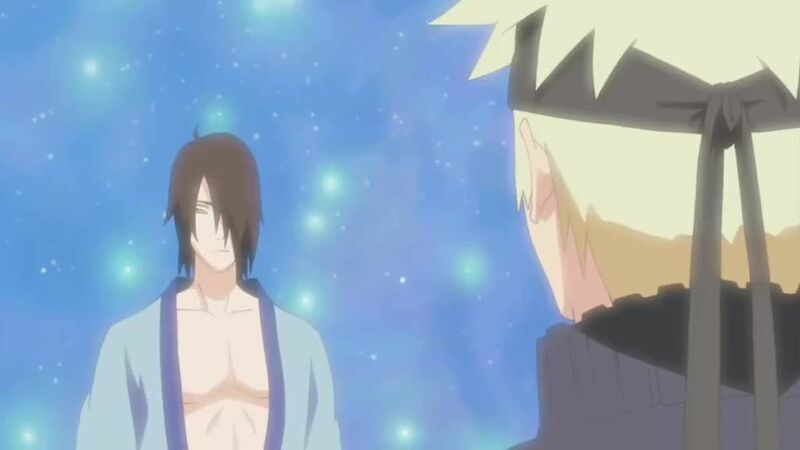 When Naruto mentions the real Madara, telling the youth to call him “Madara” or Tobi if he likes, the masked man proclaims that his identity is pointless and that all he cares for the completion of the Eye of the Moon Plan. Tobi explains the world is worthless and that both Naruto and Bee should understand the misery it holds better than anyone else. However, Naruto admits his life with a Tailed Beast inside him isn’t that bad while calling Tobi a liar and vowing to unmask him. However, as each of the reanimated Jinchuriki grows a tail, Tobi declares he will capture Naruto and Bee to fulfill his plan.